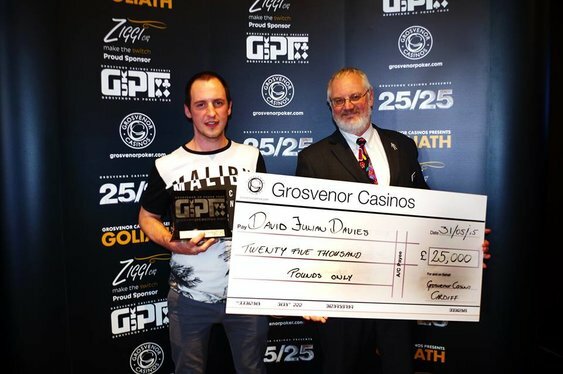 The Grosvenor UK Poker Tour (GUKPT) has crowned its latest winner after Julian Davies took the honours in Cardiff on Sunday. 171 entrants took to the tables in the Welsh capital, exactly the same as the 2014 field in fact, meaning another hefty overlay for Grosvenor. Davies took the biggest chunk of the guaranteed £100,000 prize pool despite starting the final day seventh out of nine. Short stacked with five players left, Davies was one card away from elimination but doubled up after rivering a queen to beat Joanne Ramsden's pocket 9s. He didn't look back from there, eventually going heads up with long-time leader Owain Carey. The final pair agreed a chop before playing on for an extra £1,000 and the trophy. After a lengthy two-handed battle it was Davies who prevailed, when his pocket aces held against Carey's short-stacked shove with QcTs. The next stop on the GUKPT Main Tour is Reading. The festival runs from 21 to 28 June with another £100,000 guaranteed in the £500+£50 Main Event. Online qualifiers are running now at Grosvenor Poker with live satellites running at the Grosvenor Casino Reading South. The 25/25 Series returns later this week with £25,000 guaranteed in both Leicester and Bolton. As usual, players have three opening flights to choose from starting at 7pm on Thurdsday. Five seats are guaranteed in tonight's £10 rebuy qualifier at GUKPT.com with three more on offer in a £22 freezeout at 7.30pm on Wednesday.